This time last year, speculation surrounded the Pegasus World Cup and how The Stronach Group would fill 12 slots priced at $1 million apiece toward a total purse of $16 million. That doesn’t appear as if it’ll be a problem this time around — not after race officials split the event into a $9 million race on dirt and $7 million turf feature set for Jan. 26 at Gulfstream Park. Now, entry costs $500,000. “They’re tweaking it, trying to make it more friendly to go,” said John Sadler, who trains Breeders’ Cup Classic winner Accelerate. Sadler said connections to Accelerate purchased their slot even before Saturday’s victory at Churchill Downs, so there’s your likely favorite targeting a final race before heading to stud. A strong cast is already shaping up to face Accelerate leaving Breeders’ Cup weekend, with as many as 10 said to be under consideration. Also pay close attention the following races known to produce Pegasus contenders: Churchill Downs’ Nov. 23 Clark Handicap (G1), Aqueduct’s Dec. 1 Cigar Mile (G1), Gulfstream Park’s Dec. 15 Harlan’s Holiday (G3) and Santa Anita’s Dec. 26 San Diego Stakes (G2). 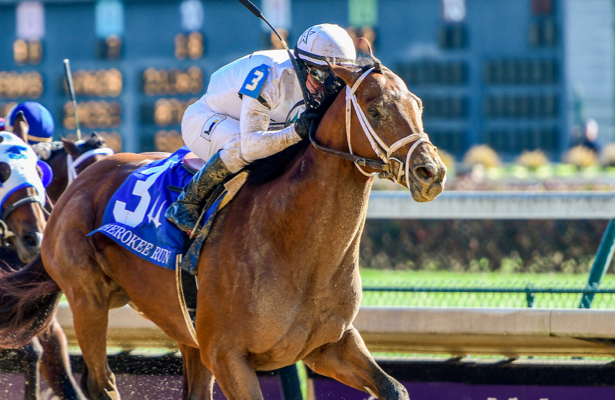 Audible: Before Breeders’ Cup action began Saturday, the Kentucky Derby’s third-place finisher returned with an authoritative score in the Cherokee Run Stakes at seven furlongs. Expect to see him next in a race like the Harlan’s Holiday as a Pegasus prep. Battle of Midway: The 2017 Breeders’ Cup Dirt Mile winner, back after a brief stint at stud, returned to the winner’s circle in the Comma to the Top Stakes and should take the West Coast route to the Pegasus with the San Antonio a likely target. Bolt d’Oro: His debut in the care of trainer Steve Asmussen should come in the Clark, and owner Mick Ruis has long spoken of the Pegasus as a potential career finale for the multiple Grade 1 winner. But he’ll have to show a return to form quickly. City of Light: The 2018 Dirt Mile winner beat Accelerate the last time he saw him at the Pegasus’ 1 1/8-mile distance. As with the Horse of the Year candidate, City of Light will stand at stud next year and may run his final race here. Gunnevera: Second in the Breeders’ Cup Classic, he could run in the Harlan’s Holiday. Trainer Antonio Sano originally sent Gunnevera on that path last year before electing to train up to the Pegasus. He looks to be improving. McKinzie: West Coast is likely retired, but Bob Baffert says he’ll be at the Pegasus with a runner. So consider McKinzie a placeholder for now. The fresh horse didn’t run his race in the Breeders’ Cup Classic. Monomoy Girl: There’s not much left for the Kentucky Oaks and Breeders’ Cup Distaff winner to do in her own division. But Monomoy Girl also needs a break. A decision whether that falls before or after the Pegasus will be made later. Seeking the Soul: Trainer Dallas Stewart never shies away from the big races and wants the Pegasus as a springboard to the Dubai World Cup. Seeking the Soul emerged last year when he won the Clark Handicap. He ran an honest second in Saturday’s Dirt Mile. Yoshida: Trainer Bill Mott said Sunday that the Japan-bred will run at age 5, and the Pegasus is an option. He was fourth in the Classic and should stay on dirt, at least in the short-term. Note that Yoshida and Audible share ownership. WinStar Farm is also in on Battle of Midway.